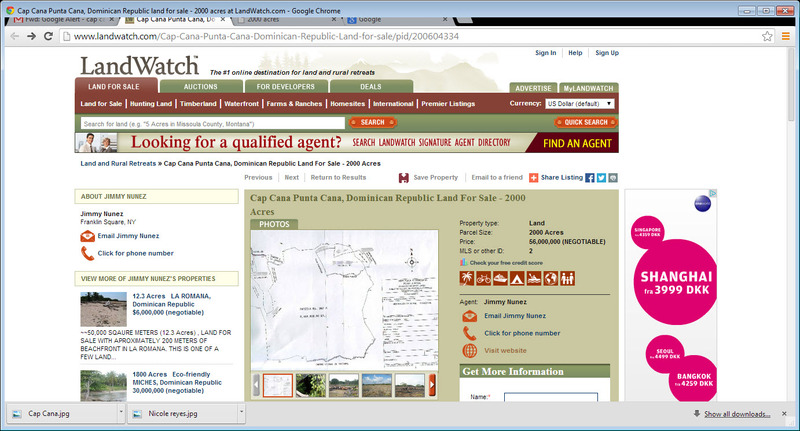 The real value of Cap Cana land Today – USD 8 per m2 or less!!! ~~LAST PROPERTY IN PUNTA CANA “BACK ON MARKET” Location, location location, its the best location in Punta Cana at a price you will not find anywhere in Punta Cana! This is the last property for sale by its owners inside the city of Cap Cana. Located in between the projects of Donald Trump and Cap Cana, overlooking the ocean and Cap Cana. Donald Trump, The Ritz Carlton, Wyndham Hotels & Resorts, Secrets Resorts, AmResorts, Solaya Hotels, are the big names, building there village inside Cap Cana. This is a Billion dollar profit investment potential, where the square meter goes from $270-$470 U.S a square meter and we are selling at $8 U.S a square meter (negotiable). This is roughly 2,000 Acres in one of the most desirable and expensive areas in the Dominican Republic. This property is ready to be built on, its flat land with bedrocks which makes construction very durable and contains a water well with 99% percent pure drinking water. Dominican Watchdog Note: Buying property in Cap Cana today is the fastest way you can lose your money!!! Follow Dominican Watchdog for the truth about the Dominican Republic! If you absolutely need a property in Dom Rep, visit Casa de Campo first. READ ALSO: In 2 years foreign property buyers lost over US$ 1 billion in Punta Cana alone - Judge released title fraud group, to continue their scams! !